If you are interested in a career in culinary arts, there's no better next step on your quest to become a chef than studying at a culinary arts school in the United States! Thousands of people every year from all over the globe come to the US to study the finer touches of cooking, baking, wine and beverage making, and running a restaurant. It's easy to see why! The US culinary scene is as diverse as its people. In many American cities you can find cuisine and great restaurants representing the best in food the world has to offer. From the latest and greatest Vietnamese Pho to the most refined French Pâté, some of the best dishes of the entire world's tables can be found and enjoyed in the US. In the past few decades, American palates have grown to love foods from many different cuisines and traditions. Thirty years ago very few Americans would have known anything about sushi, burritos, or pad thai, but nowadays Americans have grown accustomed to eating all sorts of delicious foods from many different ethnic or cultural backgrounds. There are few other countries where an international student can learn to cook in so many different styles and with an array of foods from around the world. Not to mention the new and amazing homegrown food crazes that are the talk of foodies the whole world over like molecular gastronomy, or the classic American fare that has gone global with fast food restaurants and pizza shops that span the globe. Being able to serve up a delicious steak, tender barbecued pork, juicy fried chicken, or delightful seared salmon is just the beginning of what you'll be able to learn in an American culinary arts school. More than the diversity of foods available, television shows like Top Chef, No Reservations, Food Challenge, Good Eats, Iron Chef America, and a great many other cooking shows promote food choice options to a wider audience than ever before. Indeed, there are entire TV channels dedicated to food preparation, culinary contests, and new recipes. A great many amateur and professional chefs work in home and restaurant kitchens from coast to coast, all with creative flair. Celebrity chefs like Alton Brown, Wolfgang Puck, Gordon Ramsey, and many more all work and live in the United States, where the attention paid to great chefs is greater than perhaps any other time in American history. What better place for an international student to pursue their passion in the culinary arts than the USA? In addition to an atmosphere where food preparation is highly prized, an international student such as you will have the ability to learn hands on doing internship programs in a variety of professional kitchens. 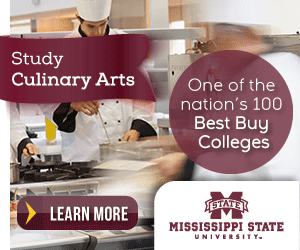 Many culinary arts schools are located in cities with thousands of restaurants, resorts, and hotels with fine professional kitchens and many have relationships with these businesses that let students work and learn off campus as well. Most culinary arts schools have their own restaurants attached to the school's campus where students gain valuable hands on experience working with real chefs making real food for real patrons. You'll be able to learn what to do in the kitchen practically as well as have the educational background to understand the chemistry of food, the roots of recipes and specialties you've always loved, the science behind ingredients that match perfectly together, and the training to hone your skills into a master chef. Often times, candidates for positions like executive chefs are required to have spent some time working or learning culinary arts abroad, and the United States is one of the top destinations for the upper levels of chefs. To make top salaries back home, a new chef will need to prove that they know what it takes to serve top dollar food in a place like the United States. The skills and talents an international student like you can learn by studying culinary arts in the United States can make you stand out from your rivals, and ensure that you quickly find a great job in the culinary arts back home or wherever you choose to bring your knives. In short, going to culinary school in the United States can make an international student a cut above the competition.